Jordan Peterson is a Canadian psychologist. He is prolific in his online talks and discussions on moral philosophy. He explores all kinds of deep issues facing us today. He draws on all kinds of cultural and religious history. His deeply authentic commitment to thinking and energetically telling the truth comes across like he’s a preacher, a modern secular preacher. You will easily find lots of his enthralling talks online. Meanwhile here’s a starter for ten, an excerpt from a discussion where he urges us to choose to express and debate our truth as a good way to live as individuals and good for everyone else too. Click here for a transcript and the linked video from a discussion with Jordan Peterson’s clarion call. 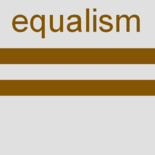 This is relevant here because we think that equalism cannot happen unless we all find our voices in good conversation and debate – our own voices and other people’s voices too. This entry was posted on 13 June 2017 by Nick Child in Culture, Equalism in general, Spirituality and tagged Conversation, Free Speech.